Hysterectomy is the removal of the uterus by surgery. Some times it also involves removal of the cervix, ovaries, fallopian tubes and other surrounding structures. It is the most frequently following surgical intervention among women at reproductive age. After 45 years the individuals uterus no more produces ovaries. 3 to 4 small surgical cuts in the belly, in order to perform robotic surgery. 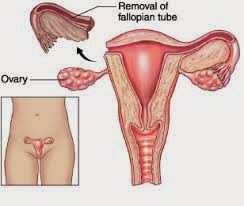 Removal of fallopian tubes at the time of hysterectomy is called as Salpingectomy. Recent studies conducted in U.S revealed that Ovarian cancer will be avoided by Salpingectomy. Among gynecological cancers Ovarian cancer carries the highest mortality rate. It is the 5th leading cause of cancer in women. The survival rate for ovarian cancer has not improved during last 50 years. 90% of ovarian cancer deaths are resultant of epithelial ovarian cancer. In contrast to traditional views where epithelial ovarian cancer is initiated from residual cells of ovaries, the recent study suggests that this will be arises from residual cells of fallopian tubes. So, we have to search for the ways to avoid ovarian cancer. Here, we found one of the possible way to avoid ovarian cancer as Salpingectomy. 1. Discuss benifits of salpingectomy in a particular patient. 2. Discuss about the safety and risks of salpingectomy with patients. 3. The prophylactic salpingectomy may avoid ovarian cancer in some patients. We need several Randomized control trails to support the present study.